The 1st round of the ISA speed world cup kicked of on the idyllic island of Karpathos in Greece. The event was run last year for the 1st time and proved to be very popular with the racers for being the most welcoming on the tour. It was not surprising then for 2007, a record 75 entrants turned up from 22 countries including Australia, Brazil and Hawaii. The line up was extremely strong including PWA sailors Antoine Albeau, Bjorn Dunkerbeck and all the Moussilmani brothers, speed stars Finian Maynard the world 500m record holder and David White production world record holder. The women’s line up was also formidable with Myself, Karin Jaggi the women’s 500m world record holder, Valerie Ghibaudo the French Champion, and an unknown Pauline Pease from Maui who won the GPS challenge all in attendance. It was set to be a very high standard competition. The 1st heat was held on the wind minimum and really tested the light wind skill level of the fleet. We were up first and the skill and racing experience showed through with a win for Valerie Ghibaudo and Karin Jaggi second and Marion Raisi third. The men’s gold fleet had the best wind of the day by far with a win for the slalom specialist Cyril Moussilmani at 38.24 knots in 25 knots of wind. Second place Light wind specialist Jose Bahadour and third the undisputed best all rounder Antoine Albeau in third. The Maltemi wind unfortunately failed to materialise for this normally very windy site. The thermal winds did provide enough wind for two more rounds with the usual suspects Finian Maynard, Bjorn Dunkerbeck and Patrick Diethelm the F2 shaper coming into the frame and giving Jose a run for his money. With the places changing with every heat and the top ten only separated by less than a knot it was going to be a tough one to call. The men’s fleets finally drew to a close with Antoine Albeau, third, Finian Maynard second and the ever consistent Jose winning the overall and the production title. Our own UK David White was not on the top of his game due to carrying an injury from the Defi wind. He still managed a very creditable 18th place. The women’s result was never a forgone conclusion, with Karin and Valerie swapping 1st place two times and me a consistent third, in the only really windy forth round I achieved 1st place and women’s top speed for the week at 33.56 knots. Making my winter training worthwhile and showing what I can do in the stronger winds on my new Tabou boards. The final result me 3rd Karin Jaggi 2nd (and 1st production) and a well deserved 1st place for Valerie Ghibaudo. 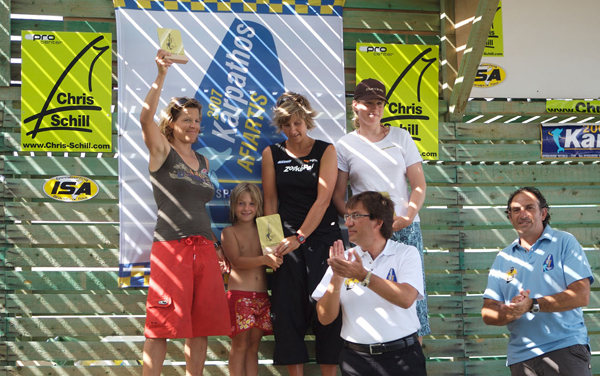 The island of Karpathos and its people put on yet another very successful event, with the team promising 2008 to be bigger and better.